Section 1: Document structure. The requirements for each section: The general structure of a document; The core chapter: Sections and Elements of a document. 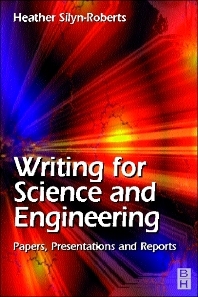 Section 2: Specific types of documents: Abstract/Summary/Executive Summary; Literature review; Research Proposal; Journal Paper; Progress Reports; Consulting or management report and recommendation report; Engineering design report; Formal letter; Emails, faxes and memos; Thesis; Conference poster. Section 3: Referencing, editorial conventions, revising, proof reading: Referencing; Editorial conventions; Revising and proofreading: Strategies. Section 4: Writing style; Problems of Style. Section 5: Presenting your work orally; A seminar or conference presentation; Presentation to a small group. Appendices.